Of late, I have been drawn to old fashioned lace doilies. It’s not that I have a burning need for lace doilies or that I am redecorating every flat surface of my apartment with perfectly round circles of tiny little stitches of white knitting cotton. 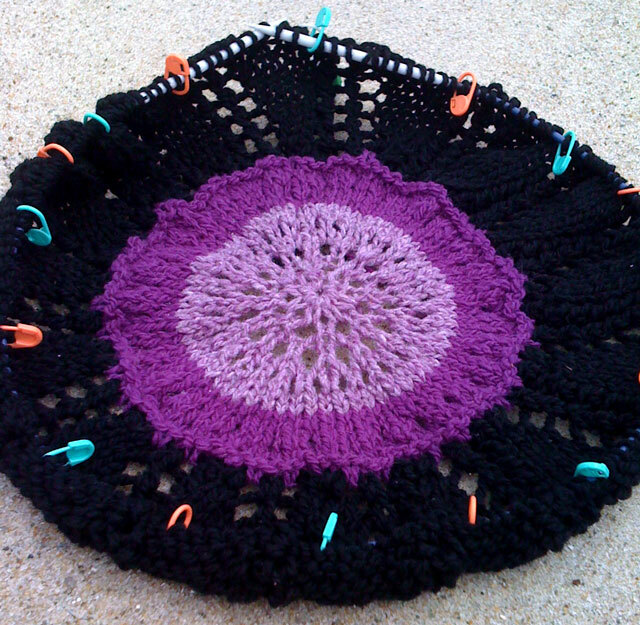 Rather it’s the way that the patterns emerge as you knit round and round. It’s the wonderful selection displayed on Ravelry and how others have used these designs in other areas such as baby blankets and shawls. 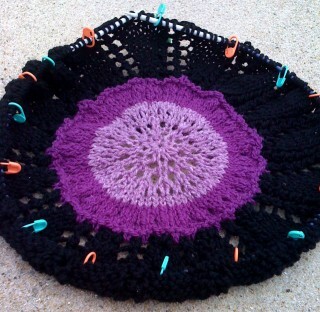 As a result, I have spent more than my fair share of time looking at the work of other Ravelers who have shared their work online and patterns posted on free sites. While many of these patterns don’t have charts to accompany them, many of the patterns use only a small number of stitches which is relatively easy to chart. Using some wonderfully colored magenta, lavender and black wool from a small VA producer named Cestari that I acquired from a friend during a yarn swap, I am making a friend a set of 4 placemats since the wool feels itchy. It’s interesting that the wool still retains its lanolin which may be affecting my hands. 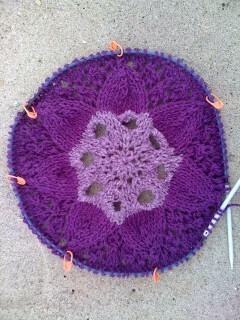 I am using size 8 needles, double points at the center and then my Denises. The problem with the Denises is that there is a tendency for them to open. Fortunately, the wool grips itself so that I haven’t had dropped stitches! Based on the lace doily in lavender that I made my friend Amanda, I decided that I would need about 60 rows to make a circular placemat. After looking through the lace doily patterns on Ravelry, I decided to make the two color lace pattern. I tried two times and found that the pattern didn’t lend itself to being adapted for my purposes, so I frogged two half complete versions. 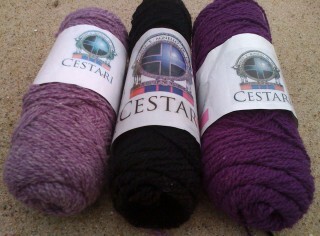 While the idea of using a pattern that was made for two colors was good, I found the pattern didn’t hold my interest. Also, it was ripply which I didn’t like either! Instead, I decided to switch to the Liz Snella’s Heirloom Lace Doily. 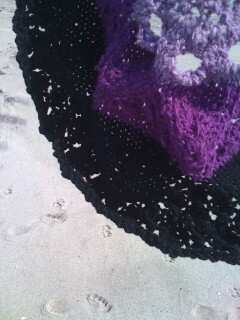 At the center, it’s similar to the Hemlock Ring Doily and Blanket. Since it has a couple of places where there are 4 rows of knit stitch, it’s good for switching colors. Also, it’s got both written instructions and charts. Being on vacation without access to a printer, I bookmarked the pattern on my computer so that I could use it.